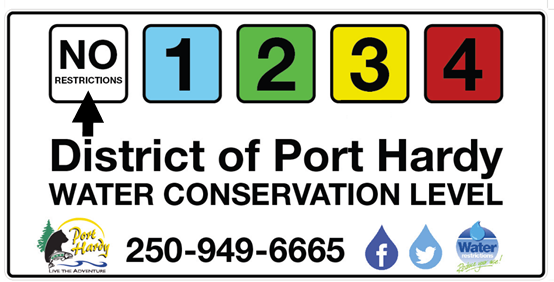 If you have any water or wastewater service related questions please contact the District at 250-949-7779 or email pw@porthardy.ca. 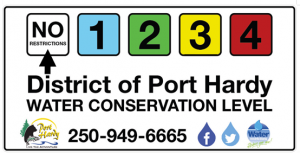 The District of Port Hardy provides quality water and sewer services to Port Hardy residents. The District bills local residents for these services quarterly. Payment is due 40 days after the invoice date. Utility amounts not paid by the due date are penalized at 2.5%. Seniors aged 65 and over who pay their utility bill on time may be eligible for a discount. During the summer months, the District may implement water conservation measures in order to ensure an adequate and safe water supply. Typically, Stage I Watering Restrictions are in effect starting May 1 to October 31 every year. For water shutoff requests, please call 250-949-7779. We require your name, address and phone number and also 48 hours notice (not including weekends and statutory holidays) so that we may schedule our staff accordingly. There is no charge for the shutoff and it must take place during regular working hours, Monday to Friday (not including statutory holidays). We will attend to turn the water off and the homeowner or the plumber can call 250-949-7779 when they are ready to have the water turned back on. If it is an emergency (i.e. a water line break), we will attend immediately. Emergency service outside of regular working hours is charged at $75 for each on or off.